The Korg Summer Sale has begun. They’ve reduced the pricing on their iOS apps by up to 50% and the sale runs through to the 20th of August. Gadget is without a doubt Korg’s flagship iOS, and also Mac app. The iOS version is reduced in price from $39.99 to $19.99. Some of the in app purchases for individual instruments seem to be on sale as well, again at 50% off. So, if you’re looking to complete or expand your set of these, now is a good time. One of Korg’s more recent apps and a recreation of their classic Wavestation. It’s on sale with 50% off down from $29.99 to $14.99. Also the additional cards in iWAVESTATION are also on sale with 40% off. So even if you have the app it’s worth taking a look. Another of Korg’s more recent iOS apps, ARP ODESSEi is a recreation of the original ARP sound, “exquisitely reproduced in software” (Korg’s words not mine). Having said that it does sound good and also it’s a universal app, which is always good in my view.ARP ODYSSEi is on sale at $14.99 (usually $29.99) and additional cards are on sale in the app at 40% off. Module has been around a while, but is one of the apps that I find very useful. If you’re interested in a handy sound library in iOS then this is worth checking out. The app itself is half price at $19.99 and the expansion libraries are also on sale at 50% off. In mobile terms Korg brought the DS-10 to Nintendo’s DS hardware. At the time that was something of a revelation. 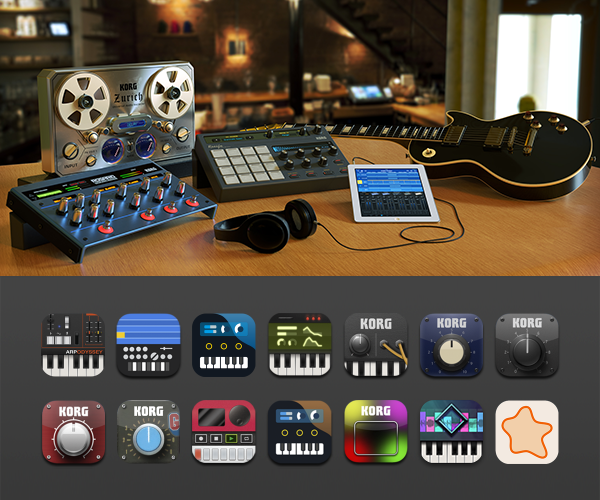 In late 2015 Korg brought it to iOS and it’s great. The iDS-10 is half price at $9.99. This is the cut down version of Module which is a bit cheaper than the full version. It is on sale as well at $14.99, usually $29.99. The original iElectribe was iPad only until Korg brought us a specifically designed version for the iPhone. The app is half price at $9.99. This is the M1 but in your iPad, and personally I find it immensely useful. My only complaint about it is that it isn’t a universal app. Having said that, I think it’s excellent, and it’s half price at $14.99. This one of Korg’s first iOS productions and I still like it even though it hasn’t had a real update in a while now. It’s on sale at $14.99. The original Korg iOS app. Still available and on sale at $9.99. Normal price $19.99. This was the special edition version. It’s ok, especially if you’re a fan. On sale at $9.99. Korg’s representation of their Kaossilator hardware for iPad. Unfortunately it hasn’t had an update in a while but it is still fun to play around with. It’s on sale at $9.99.